There’s nothing quite as magical as spending time together enjoying a fun getaway to Orlando. At the end of a busy day, all everyone wants to do is sit down, enjoy a meal, unwind and get ready for the next day’s adventures! Who wants to get dressed up and go out someplace to eat, only to face the hassles that go with that? The easiest solution is pizza delivery to Fairfield Inn Lake Buena Vista from Caprino’s Italian. As soon as you place your call, wheels are set in motion to create a delicious pizza, the kind that Italian food lover’s dreams are made of. Chef Stefano Tedeschi is the head Chef at Caprino’s, and the creative mastermind behind some of the most unique pizzas you’ll find anywhere. He received training beside classical Italian Chef’s and gleaned knowledge, tips and inspiration from them. He knows that true pizza making excellence comes from authentic imported ingredients combined with a flair for creativity. 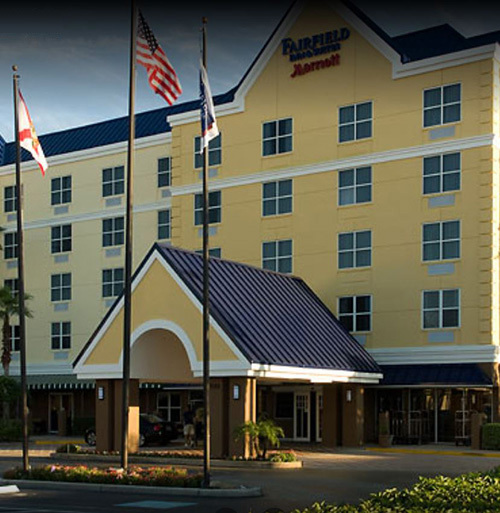 We’re confident that you’ll agree that this is the best pizza near Fairfield Inn & Suites Lake Buena Vista. Imported flour and water are just the beginning. Caprino’s pizzas are then topped with a special recipe tomato or garlic cream sauce and topped again with fresh authentic Italian meats, crisp vegetables at the peak of ripeness, and hand shredded Italian cheeses. Your pizza will be cooked in a specialty brick pizza oven at the perfect temperature to create the crispest crust and delicious melty cheeses. Deciding What Toppings to Get! With a vast choice of delightful pizza toppings, the most challenging decision you’ll have is what toppings to put on your pizza! Plain cheese may be what the youngest among you will enjoy, and from there you can choose traditional toppings like sausage, pepperoni, extra cheese, mushrooms or onions. Adventurous eaters may find that toppings like calamari, pineapple, figs, spinach, imported Feta, artichokes, salmon, chicken, shrimp, bacon or Sopressata are their ticket to happiness. 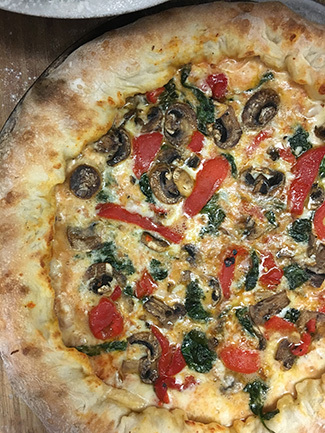 Veggie lovers can choose toppings like Kalamata or black olives, green peppers, spicy banana peppers, roasted red peppers, arugula, spinach, mushrooms and onions to create a veggie lovers delight. Cheese choices like provolone, mozzarella, Asiago and Parmesan Reggiano give any pizza that melt-in-your-mouth sensation. Everyone will soon discover that Caprinos Italian pizza delivery to Fairfield Inn Lake Buena Vista 32836 is a smart choice! 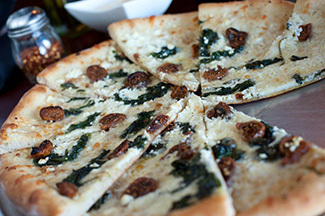 You have unique pizza choices that adventurous eaters will love through Caprino’s Italian Restaurant. Your new go-to restaurant for pizza adventure is also the best pizza restaurant near Fairfield Inn & Suites Lake Buena Vista FL 32836. Tomato lovers will enjoy the Margherita Pie, featuring San Marzano tomato sauce topped with melted mozzarella and basil. The Arrabiata Pie features spicy Soppressato, spicy banana peppers, provolone and mozzarella blended and cooked to perfection. Sausage lovers will adore Chef Stefanos Special with spicy sausage, Prosciutto Di Parma, ricotta, provolone and mozzarella topped with roasted red peppers. Pizzas like the Hawaiian Pie thrill those who love the delightful combination of sweet and salty, featuring toppings of ham, diced pineapple and mozzarella and provolone cheeses. The Bianco Pie features a delectable white base with Ricotta cheese, fresh basil, cracked black pepper, spinach and Asiago cheese. 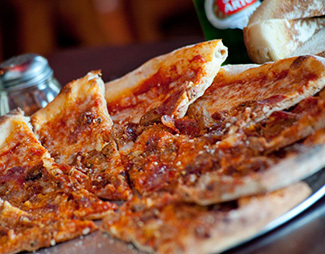 Caprino’s knows that when you and your loved ones truly enjoy your pizza, you’ll be back! Total satisfaction is the focus and priority of Caprino’s. With Americans eating about 350 slices of pizza per second, Caprino’s is in the race to see that every single pizza they make is delicious and tempting, and thoroughly enjoyed by everyone traveling with you. You’ll soon discover why Caprino’s has earned the reputation as the best pizza near Fairfield Inn & Suites Lake Buena Vista. Pizza artisans know that making a great pizza is just the beginning. Your custom-made pizza is delivered hot, fresh from the oven and fast, straight to your doorstep. Open the box and the enticing aroma will soon make everyone gather around for a captivating pizza experience. After all, Orlando is a place that creates magic. Caprino’s strives to be the Best Pizza delivery near Lake Buena Vista FL 32836. It’s an honor for us when we’re chosen to deliver a great pizza to you! We can almost hear the excited squeals and giggles when pizza is mentioned as the dinner choice for tonight. Kids of all ages will be able to agree that pizza delivery to Fairfield Inn Lake Buena Vista is the primo choice for spicy, melted cheese perfection, delivered hot, fresh and fast. Orlando is memorable for a lot of reasons, and now delicious local pizza from Caprino’s can be one of your fond memories.